d-amino acids are now recognized to be widely present in organisms and play essential roles in biological processes. Some d-amino acids are metabolized by d-amino acid oxidase (DAO), while d-Asp and d-Glu are metabolized by d-aspartate oxidase (DDO). 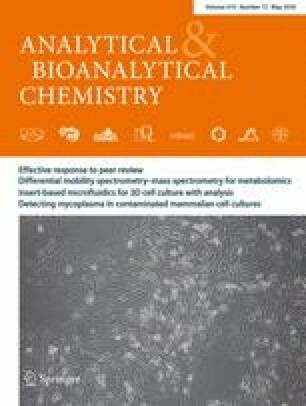 In this study, levels of 22 amino acids and the enantiomeric compositions of the 19 chiral proteogenic entities have been determined in the whole brain of wild-type ddY mice (ddY/DAO+/+), mutant mice lacking DAO activity (ddY/DAO−/−), and the heterozygous mice (ddY/DAO+/−) using high-performance liquid chromatography-tandem mass spectrometry (HPLC-MS/MS). No significant differences were observed for l-amino acid levels among the three strains except for l-Trp which was markedly elevated in the DAO+/− and DAO−/− mice. The question arises as to whether this is an unknown effect of DAO inactivity. The three highest levels of l-amino acids were l-Glu, l-Asp, and l-Gln in all the three strains. The lowest l-amino acid level was l-Cys in ddY/DAO+/− and ddY/DAO−/− mice, while l-Trp showed the lowest level in ddY/DAO+/+mice. The highest concentration of d-amino acid was found to be d-Ser, which also had the highest % d value (~ 25%). d-Glu had the lowest % d value (~ 0.01%) in all the three strains. Significant differences of d-Leu, d-Ala, d-Ser, d-Arg, and d-Ile were observed in ddY/DAO+/− and ddY/DAO−/− mice compared to ddY/DAO+/+ mice. This work provides the most complete baseline analysis of l- and d-amino acids in the brains of ddY/DAO+/+, ddY/DAO+/−, and ddY/DAO−/− mice yet reported. It also provides the most effective and efficient analytical approach for measuring these analytes in biological samples. This study provides fundamental information on the role of DAO in the brain and may be relevant for future development involving novel drugs for DAO regulation. The online version of this article ( https://doi.org/10.1007/s00216-018-0979-9) contains supplementary material, which is available to authorized users. We would like to thank Dr. Adam L. Hartman (NIH and JHUSOM) for providing the mouse brain samples for this study, and the ddY mice used in this study were a kind gift from Thomas N. Seyfried (Boston College) to Dr. Hartman. We are also grateful to Dr. Hartman for his assistance with the statistical analysis and comments that greatly improved the manuscript. We thank AZYP, LLC, for their technical support for HPLC chiral column technology. We would also like to thank the Shimadzu Center for Advanced Analytical Chemistry for the use of the Shimadzu instrument (LCMS-8040). This work was supported by the Robert A. Welch Foundation (Y0026) (DWA). The study was carried out under experimental protocols approved by the Johns Hopkins Institution Animal Care and Use Committee.